Earlier this week I read Vannevar Bush’s seminal 1945 essay “As We May Think.” It was as remarkable as I had heard in terms of his ability to predict the future, and I was amazed at just how many kernels of current technical and communciation realities it contained. Like Doug Engelbart’s “Mother of All Demoes” which introduced the computer mouse, word processing, networked video calls, and hyperlinks all in an hour an a haf, Bush’s essay maps out everything from the future of photography, wearable computing, credit card machine, wireless communications, Wikipedia and the web more generally, which Bush refers to as the Memex. It’s an essay with a remarkable range of registers, from technical to practical to hopeful, and its that last one that was so inspiring for me while reading. This article is just as much a historical document as it is a roadmap for the future. Written in 1945 it breifly frames the previous five years of intesive war-time scientific research dedicated to mass destruction (in the form of the Atom Bomb) as a turning point for civilization. Rather than continuing down this path, Bush himself effectively ran the militiary industrial complex during WWII in the U.S., the post-war moment provids the opportunity to direct that collaborative research momentum to transform the way humanity communicates. Re-think how we share information, solve problems, and provide “a record of ideas….so that knowledge survives and endures throughout the life of a race rather than that of an individual.” It’s powerful because it helps to position Bush, and after him Engelbart, in a tradition of the internet (and later the web) that is first and foremost grounded in the idea of sharing as much of the world’s knowledge as widely and openly as possible. Connecting the history of the internet and new media with Bush and Engelbart immediately frames it as a deeply humane, noble pursuit that is, paradoixically, born out of and continually developed through and/or alongside the militiary industrial complex. That immediate tension still very much exisits remains, and id one of the more fascinating elements of internet history I hope comes across this week in the Internet Course. The other part of Bush’s essay that fascinates me to no end is how he is pushes up against the limits of what’s possibly through analog technology. This essay provides an excellent opportunity to talk with a class of students about the difference between analog and digital technologies, and what that has meant for the future of computing and culture. 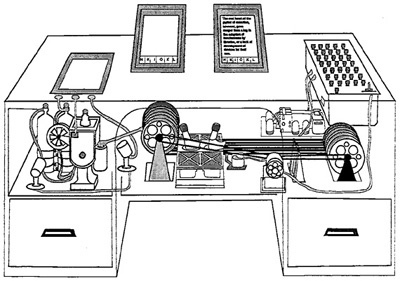 When Bush talks about the Memex, he imagines it as a “sort of mechanized private file and library” storing “all his books, records, and communiations.” What’s more, it’s a system that can be fit within a desk consisting of milliosn of compressed records on microfilm that can be immediately retrieved and linked to create a web of trails that the user follows. As Bush lays down the entire vision, it’s obvious he’s describing what we would call the web at almost every point, the only difference between his vision and our reality is that it would ultimately be accomplished through digital, not analog, computers. His vision of an analog Memex of microfilm wouldn’t have been practical because it explodes at the point of seamlessly linking various resources and breaking out of the linear continuity of analog information. Therein is the magic of digital information, it’s discontinuous. The digital enables the web trails that Bush discusses that cut across any one logical and continuous system to emerge by transmuting resources into binary packets of information that can be transmitted easily. 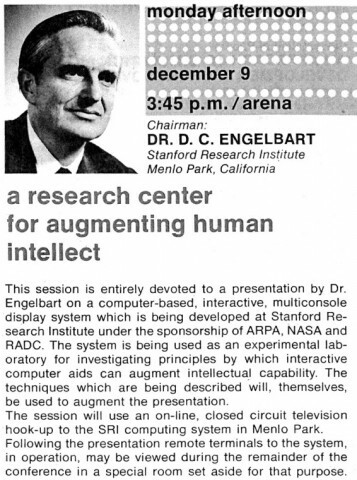 I spoke to this point a bit last Tuesday when teaching this essay, and I wonder if it might not be just as useful for the Domain of One’s Own Faculty Initiaitve folks who read “As We May Think,” as well as watched Engelbart’s demo. What does it mean to be a “digital” scholar in this regard? The term is used pretty liberally now, but how do we start to very specificaly map it onto the work we are doing in higher ed? Both Bush and Engelbart seem to share the basic principle that the emerging communication technology that would become the internet is premised on one thing above all others: “augmenting human intellect.” How does that fit in with the way we use it? This entry was posted in Domain of One's Own, Faculty Initiative and tagged analog, digital, Doug Engelbart, faculty iniaitive, fi15, tic104, Vannever Bush. Bookmark the permalink. Bush’s essay is easily seminal, and worth even pausing that we can read it entirely, for free, openly, anywhere we can now connect to the instantiated webbed vision of his Memex. It’s even worth reflecting on the subtle implications of his title– suggesting the complexity of thinking he describes as much more than what can be neatly arranged in a card catalog. If I remember, he hints at the semantic web and even gesture interfaces. It was the notion of pathways and tracks through information that always intrigued me; that he saw a way I could navigate through a series of informational explorations, and then be able to share it with someone else, in a format they could modify and make their own. 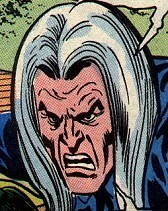 Maybe he was Web -2.0… so ahead of his time. I love watching what you are doing with the class, it dovetails so well with what gardner has done in his New Media Seminars and foreshadowing his summer project. Brilliance shines again from F’burg, while much of edtech seeks light from Silicon Valley, they ought to be looking at central Virginia.